Eterno pedestals offer one of the fastest and easiest to install support systems for constructing elevated decks and plaza decks due to a number of unique benefits. 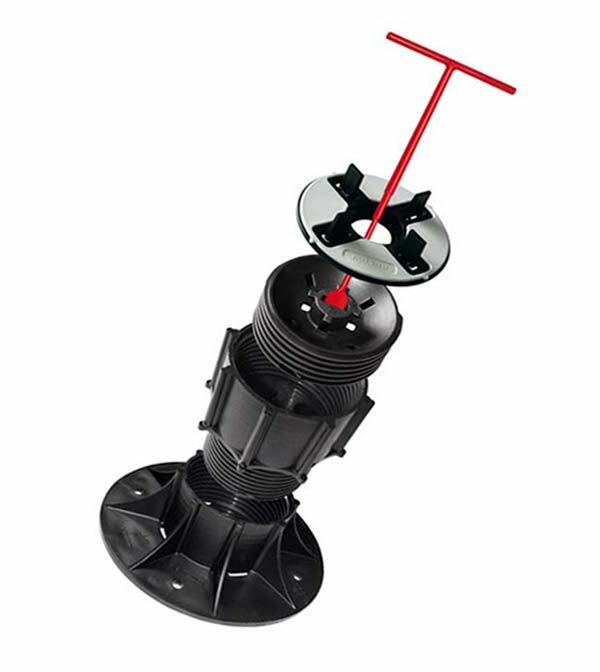 The Eterno SE range of adjustable screwjack pedestals incorporates a self levelling head to compensate for sloping ground and the pedestals offer continuous height adjustment from 1 1/2″ to 21 3/4″. Shims of 1 or 2mm thickness can be laid in segments between the paver and the pedestal head to compensate for any slight differences in the thickness of adjacent pavers installed on the pedestal. Normally such shims are not required with porcelain pavers due to the tight dimensional tolerance in manufacture. From 1.125″ to 8.5″, (models SE0 to SE5) the pedestals consist of a circular base component, a threaded central column and a self leveling head. From 8.5″ to 21.75″, screwed extension elements are added between the central column and base. A comprehensive catalog for the Eterno series of adjustable height pedestals can be downloaded from our Brochures page.